"Our Dad was a cancer warrior. 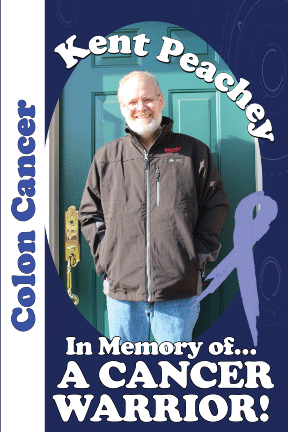 He heroically battled colon cancer for 17 months. His cancer eventually spread to his abdomen, liver, lungs, and brain, but that didn;t break his will to fight or laugh and smile. Through the innumerable surgeries, chemo treatments and radiation he continued to work, often simultaneously. There were even a few nights in the ER he tried to sneak out to answer maintenance calls since worked in the hospital! Though quiet, he laughed and joked with almost everyone he met. He loved his family very much and his three girls were his life and legacy. He was a wonderful husband, father and friend and is deeply missed by all who knew him. We walk/run in memory of you Kent." Please contact Teah, at cbatdorf@hmc.psu.edu or 717-531-1541.